Developing content for your website is critical, you should all understand that by now. When it comes to e-commerce sites, informative content, or lack thereof can be the difference as to why a site visitor makes a purchase from you as opposed to your competitor. Typically e-commerce sites have no issues when it comes to the amount of content that they feature on their websites. To say that content is important is well, stating the obvious. Content is not just king for the search engines, content is important for your target audience and the people that actually visit your website. Planning a content development strategy will help you determine the type of content that your should feature on your site. Visit any large e-commerce site and you will see a lot of similarities in terms of the type of content that is featured on these sites. 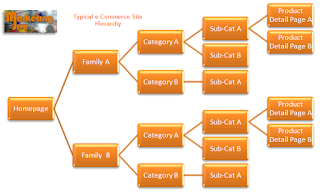 The fact of the matter is, with many e-commerce sites there is a number of content pages that exist based on the typical hierarchy that we see above. In addition, many e-commerce sites will also have what we call branded pages that feature vendors or suppliers. These branded pages can be very important to an e-commerce site and as a result, can drive a lot of additional qualified traffic to your site. The importance of thee branded pages can not be understated. Build Authority for Vendor Brands - a well optimized "branded" page can assist an e-commerce site in the search engine results for vendor terms. 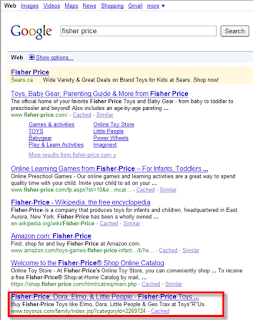 Think of a site like Toys"R" Us who have vendor branded pages for vendors such as Hasbro of Fisher Price. 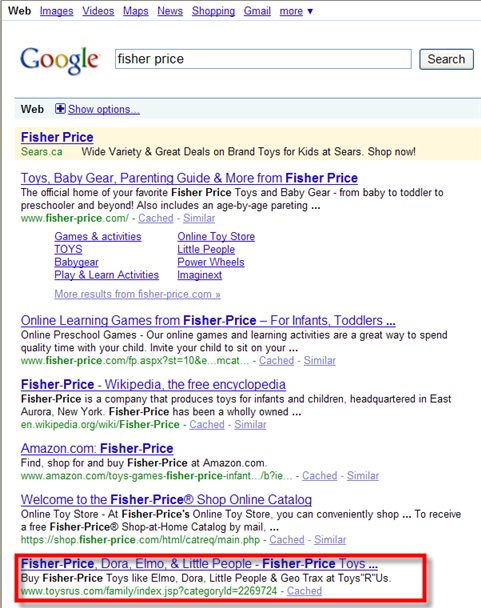 We did a search for "Fisher Price" in Google and found Toys"R"Us on the first page of results in position six. This is no doubt is driving additional traffic to the Toys"R"Us site that they would otherwise be missing if they did not have a "Fisher-Price" branded/vendor page on their site. Establish a great donor page for interlinking - branded pages are great pages to leverage the branded authority and link to relevant category or even deeper product level pages. As part of an internal linking strategy, this can provide some great link authority to deeper site pages. Build Trust with your Audience - there is a good chance that your audience is expecting to see that you carry certain brands. If you are Home Depot for example, people expect that you will carry Dewalt Power tools. For the record, Home Depot does a great job with their Dewalt Tools brand page on their site. By featuring "brand" pages on your e-commerce site, you can help build that trust that users are looking for. If you are a well known brand such as Toys"R"Us or home deport, people will be expecting to see these brands being featured on your website. This can be a great opportunity to optimize for the various brands and drive additional traffic to your site that is already somewhat qualified. Naturally build your external link inventory - if you have a good relationship with your suppliers or vendors, you can request that they place a link from their web properties to their brand page on your website. If your branded page becomes somewhat of an authority, there is a good chance that your vendor might link to you regardless. This is a great way to build up authoritative links to your site for high traffic driving vendor phrases. Content development can take many forms. If you are an e-commerce site and you do not currently feature brand/vendor pages, you might want to consider it. These pages can be great for driving traffic to your site and can also assist in generating links to your web properties. This content is easy to create and even easier to incorporate into your site's existing content. The return that you get from brand/vendor pages will make you wonder why you didn't incorporate this type of content earlier.